As London Fashion Week draws to a close, fashionistas can expect to see some of its boldest and most outgoing trends recast along the spangled shops of the High Street. Designers this season showcased their Autumn and Winter lines, drawing on inspiration from decades past with a standout shift towards 1970’s flares, fringes, and minis. Touches of vivid 80’s palettes and floral 60’s prints also memorably sashayed the catwalks, but by no means does that signal a transmutation into Throwback Thursday for wardrobes worldwide. A strong focus on textures, structure, and negative space across collections meant that the best in show balanced artisan embellishment with sleek, contemporary tailoring, narrating a modern woman who is confident, dangerously feminine, and dressed for anything. 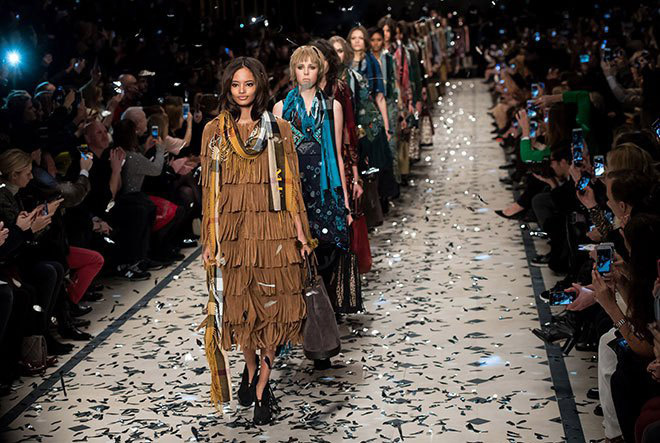 The British Fashion Council, the body at the helm of London’s 61st Fashion Week, is known for using the five-day spectacle to highlight designers both widely established and relatively new to the scene. Responsible for handing over the world’s stage in the form of a livestream viewership over 190 countries strong to brands like Erdem and House of Holland through its initiatives, those were some of the most coveted tickets this February. Over 250 British designers exhibited their a la mode at venues throughout London, while street fashion met high couture as celebrities and chic-geeks alike gathered at the event’s home base, the design showrooms and main stage of the brooding, neoclassic Somerset House. 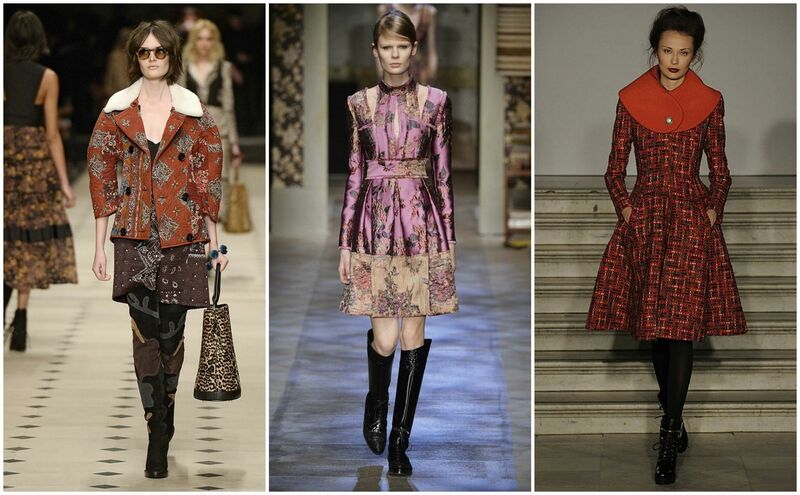 Predictably, when it comes to major brands, Burberry stole the limelight. While it was on-point with bohemian suede and sheering coats, spotting touches like heavy fringing and accessorizing with retro glasses and bucket bags, the lines’ genius was down to its textures. Whip-stitching, quilting, and embroidery echoed throughout the collection, a nod to its thoroughly British heritage and the nation’s varied craft industry. Following suit, Topshop Unique celebrated bygone eras with luxe furs, florals, and tweeds, while Vivienne Westwood broke out with bold colours and prints. J.W. Anderson outfitted models in belts sporting big, round buckles, and Jonathan Saunders brought turtle necks and cat-eyed glasses back into the realm of the ultra-chic. The general feeling was that the age of minimalism has met an end. Reaching back further into time, Erdem’s use of rich upholstery fabric echoed set designs of the 1950’s, and its pairing of dainty dresses with inky leather riding boots made for a luxurious and empowering tour de force. Colour palettes favoured the bold with Mulberry, Emerald, Bittersweet Orange, and Sapphire owning its space in each collection, especially that of Paul Costelloe, who toyed with form in his Jacquards and Victorian tweeds, with models in Gibson do’s leaving bright red lipstick smudges on champagne flutes at the after-party. Statement colours drawn into geometric shapes across fabrics meant that oversized coats and layered looks still had the slimming, tailored effect contemporaries prefer. On-the-move designers not only focused on the woman who was ready for anything, but paramount in London, ready for any weather. Jean-Pierre Braganza with his film noir structured airtex dresses covered in peplum folds and aviator jackets crossed evening-ware with outerwear flawlessly in looks that could easily have walked off the runway and down to the West End for a night out. Xiao Li, newer to the scene, displayed the height of structuring, echoing the 1205 show with its use of highly constructed pieces that wielded negative space to create form and flow. Whereas Xiao Li’s anti-establishment ware used traditional knits in non-traditional colours, 1205 went with conservative shades in featherweight polyester, starched swiss cotton voile, and anthracite bouclé baby alpaca, giving its coats and drapes sumptuous body. Wilson PK, Le Kilt, and BELSTAFF all took their cue from artists and adventurers, with Wilson PK’s cubist focus blurring the lines of ‘then’ and ‘now’ with 80’s style big-shoulders mixed with 3D printed fabrics. Le Kilt re-imagined the tartan look for today’s woman, with a nod to subversive punk style, while onlookers were serenaded by a Lady GaGa arrangement by a live string quartet. BELSTAFF showed off more sheering and wax cotton, while girls wore their hair slicked back and their leathers loose, like 1920’s aviatrix Amelia Earhart. The spaces associated with fashion week complimented the runway looks, with the design showrooms at Somerset House packed to the max with geometric looks and loud colours. At Fashion Scout, the designers on the floor played with textures, distressing and bedazzling in equal measure, pushing limits with irreverent artistic abandon. Presentations in crumbling manors and speakeasies continued to blend elements of the elegant with a devil-may-care attitude. Events throughout the week also lauded the general theme, with the launch of Jade Parfitt’s fashion film “The Chase” appearing as a reverent, girl-powered re-imagining of Diamonds are Forever and Goldfinger. The street fashion was also on point, with Londoners decking out in playsuits and oversized jackets, highlighter shades and pastel caplets, loose hair and vivid lipsticks. In all, this season’s London Fashion Week mixed all the bravado of the past with the all-purpose needs of today’s women. Confidence is timeless, and designers reached into the vault to pull out a perennial combination of the intrepid colours, brazen patterns, and fearless shapes that characterized the 60’s-80’s, while keeping the fabrics cutting-edge, stitches slimming, and makeup and hair touches deliciously minimal, showcasing that it was the women wearing the clothes, and not the other way around.